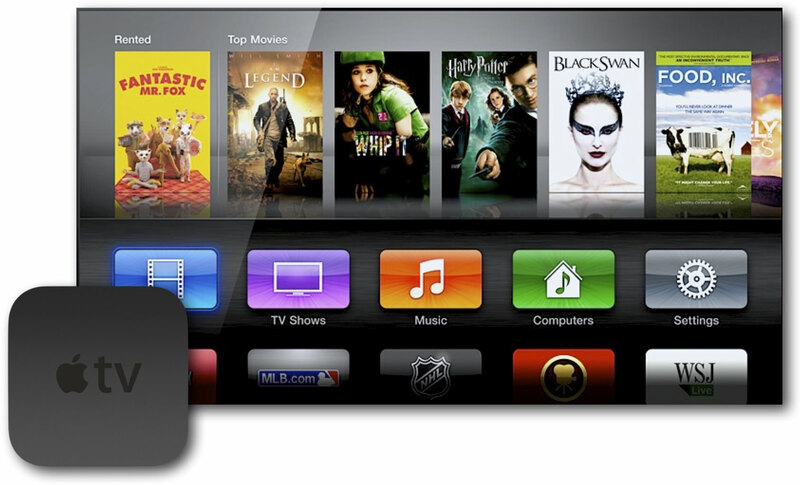 Apple’s(s aapl) little television hobby is proving to be big business. Speaking at an Apple shareholder meeting on Friday, Apple CEO Tim Cook said more than $1 billion worth of Apple TV devices were sold last year, Reuters reports, which could mean Apple’s fiscal 2013 and not calendar year. Apple clarified the revenue number by telling Re/Code the $1 billion figure includes content sales. Perhaps not so coincidentally, 9to5Mac notes that Apple is now offering a $25 Apple Store gift card with the purchase of an Apple TV, indicating new hardware could be inbound. I can understand why Apple has considered Apple TV to be dubbed a hobby for so long. It’s really the one Apple hardware product that Apple doesn’t maintain key control over the content on the device. Yes, there’s the iTunes Store for movies, music and such, but there are also hundreds of broadcast and cable channels not on Apple TV due to licensing and payment arrangements. And in the case of some channels that are on Apple TV — HBO Go comes to mind — Apple doesn’t get a cut of the subscription revenue. It’s interesting to note how Google’s Chromecast(s goog) figures into this segment. Google hasn’t released sales figures and the device is really only just getting started: It launched with perhaps a dozen apps last year and only this month saw an SDK release for developers to bring content to the Chromecast. 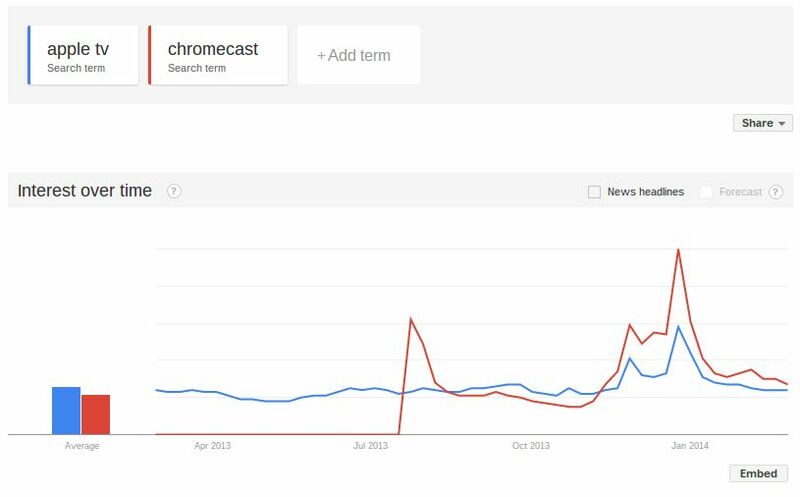 Analyst Benedict Evans tweeted out information from Google Trends that at the very least shows interest in both the Apple TV and Chromecast; the chart is based on the relative number of Google searches for both products. With annual revenues topping a billion dollars for both hardware and content — a figure likely to grow beyond that as consumers increase their home broadband speeds and look to add web-delivered content to older televisions, — it might be time for Apple TV to graduate to from being just a hobby. Considering all I own for 10ft streaming is a PS3, I’m confused why is the Apple TV still selling strong despite the Chromecast’s pricepoint? Could anyone fill me in? Is it just brand recognition? Note: Tim Cook called it a hobby when it was a $.5B biz. Even at $1B, it’s about .6% of revenue. But doubling annually, with something new coming. Helluva hobby! Been a user since Day 1 – and we love ours. I think I’d like the download feature revisited with storage returned to the design. Looking forward to the A7 chip and – eventually – a range of sources that matches my current DirecTV downloads. Which is about 30+ providers out of the hundreds available.